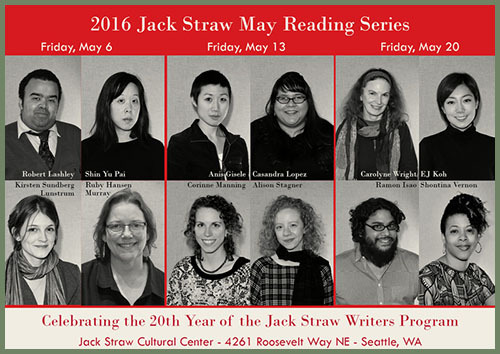 The twelve 2016 Jack Straw Writers, selected by curator Karen Finneyfrock, will present their work in a series of three Friday evening readings in May at the Jack Straw Cultural Center in Seattle. Further details at Jack Straw and on Facebook. If you — or someone you know — is age 14-19, a Seattle resident and a poet, applications for the next Seattle Youth Poet Laureate will be accepted through Sunday, May 1, 2016. The Youth Poet Laureate receives a book deal from Penmanship Books and performs and tours the city at a variety of events throughout the year. Find the application and program details on Seattle Arts & Lectures Writers In The Schools (WITS) page and follow the Seattle Youth Poet Laureate on Facebook. Back in early March, we posted the news that John Marshall would be retiring from the helm of Open Books, in Seattle, and the fate of the outstanding poetry bookstore was unknown. Such good news. The store will be open until 7:00pm on Saturday, April 30, 2016, in honor of Independent Bookstore Day. Stop by and say congratulations (and pick up a few poetry books while you’re there). From the Stuff We Love file comes this project in Miami, Florida. 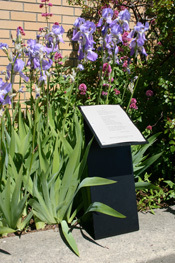 In cooperation with the Miami International Airport Division of Fine Arts and Cultural Affairs and the literary culture organization O, Miami, artist Randy Burman has created a National Poetry Month project called Poems to the Sky. Short poems written by 3rd and 4th grade students at two local elementary schools have been painted on rooftops of Miami buildings in one of MIA’s several flight paths. These gigantic, skyward murals, visible to airplane passengers, are being documented with drone video and photography and brought back to the schools where they were created. BravO, Miami! Every day is a busy day for the Washington State Poet Laureate, Tod Marshall, so Bellingham is particularly pleased that he is here as the featured reader for poetrynight, tonight, Monday, April 25, 2016, at the Mount Baker Theatre, in the Encore Room. There will also be an open mic. Doors open and sign-up at 7:30pm. Poetry begins at 8:00pm sharp! See you there! If you haven’t made your summer plans yet, this might be a good time to start thinking about the writing months ahead. When it comes to writing festivals and retreats, summer begins in May. Below is a selection of 2016 goings-on in the wider Cascadia region. Some of these events have fees and require applications. Follow the links for more information.